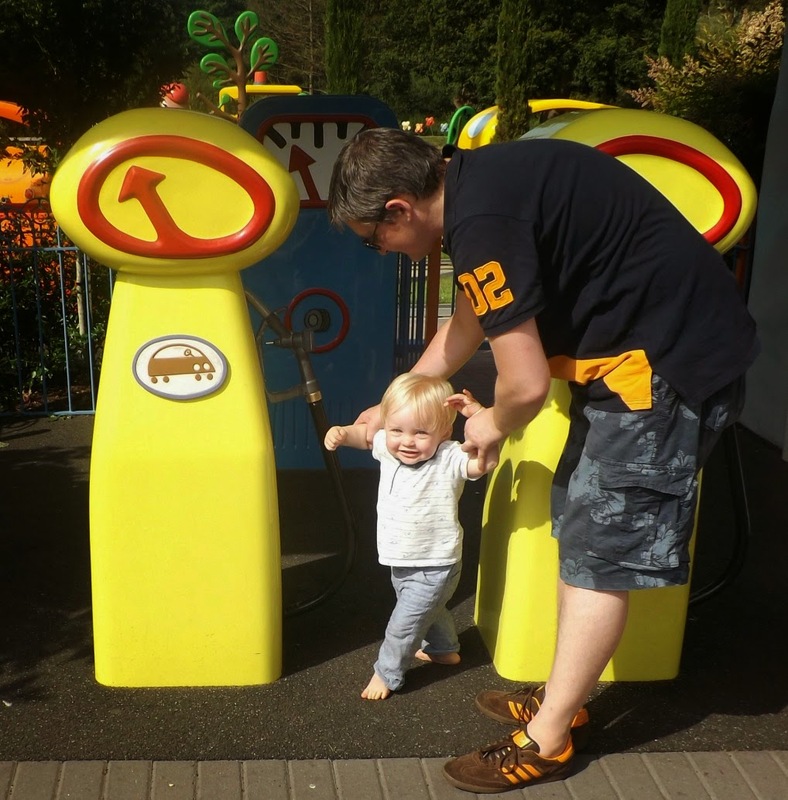 Our Trip To...Peppa Pig World! 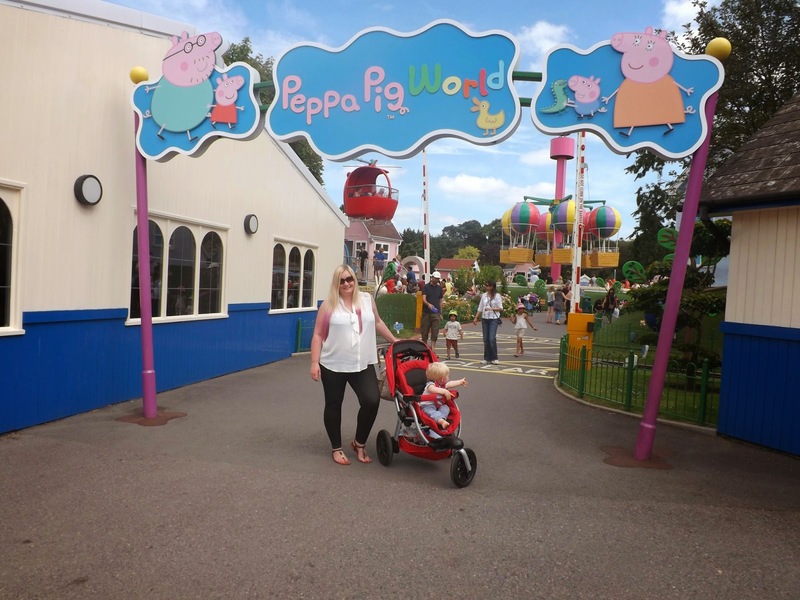 This weekend, we took a much anticipated trip to Southampton to visit Peppa Pig World at Paulton's Park. 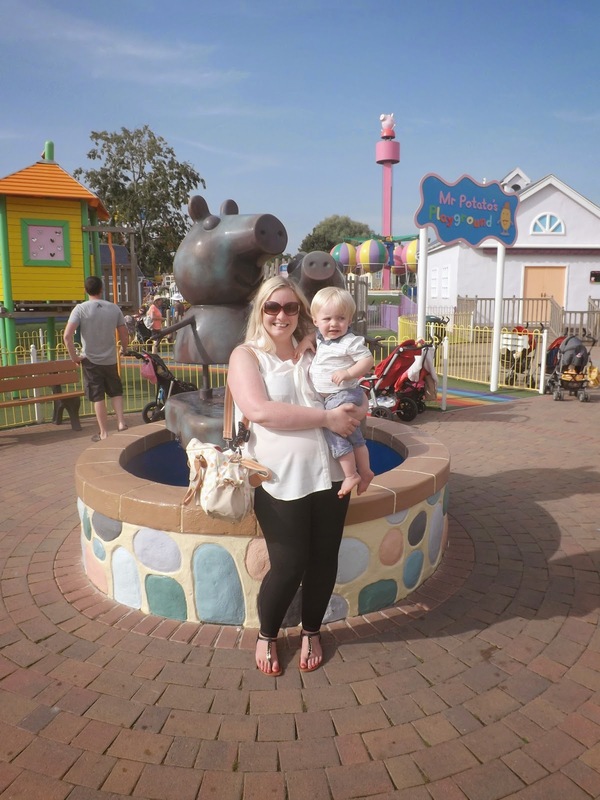 It was somewhere we've wanted to go for a while as Tyne just loves Peppa Pig and I thought it would be a really lovely family trip. 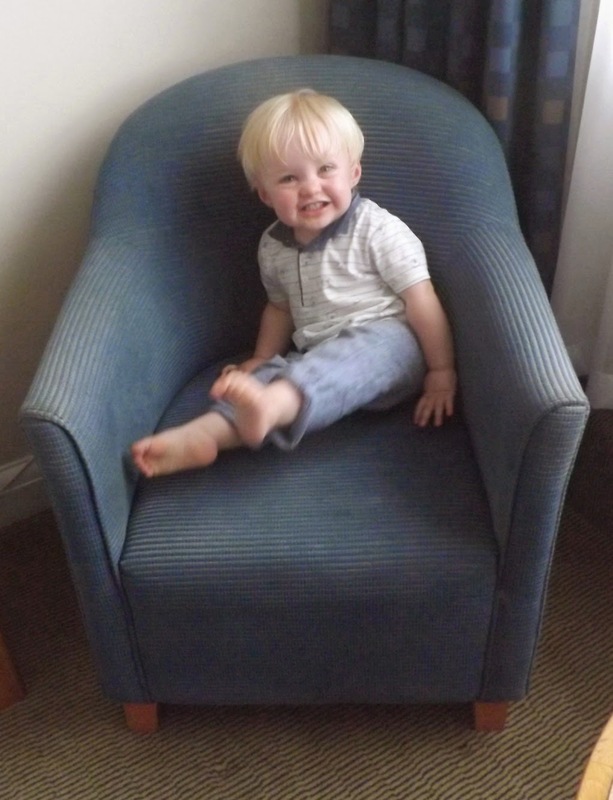 Luckily my parents very kindly paid for us to go to Southampton for the night, stay in a nearby hotel and have 2 days entry to the theme park as part of their gift to Tyne for his 1st birthday. We knew we wanted to go while the weather was nice and before the schools broke up for Summer, so July seemed a good time. We set off from Devon at about 10 am on Friday to miss the morning rush, and the journey was a very pleasant one....I have been to Southampton before as its where the cruise terminal is so I knew that the route wasn't all motorways but rather nice country roads which I much prefer, the scenery was lovely! It took us around 2 and a half hours, and we arrived just in time for lunch. We headed in to the park straight away, no queues, and settled at the first cafe we found to give Tyne his lunch - we'd brought a picnic along as we weren't sure what sort of food would be on offer. After lunch, we set off to find Peppa Pig World! 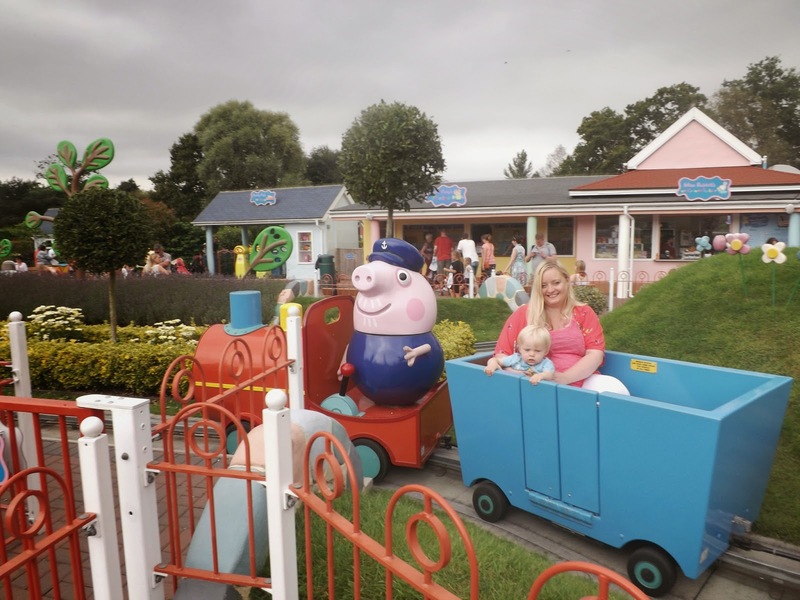 Incase you're not familiar with it, Peppa Pig World is one section of Paulton's Park which is a lovely theme park and a great mix of rides for older & younger children, as well as having lots of lovely gardens and lots of birds and animals on display. 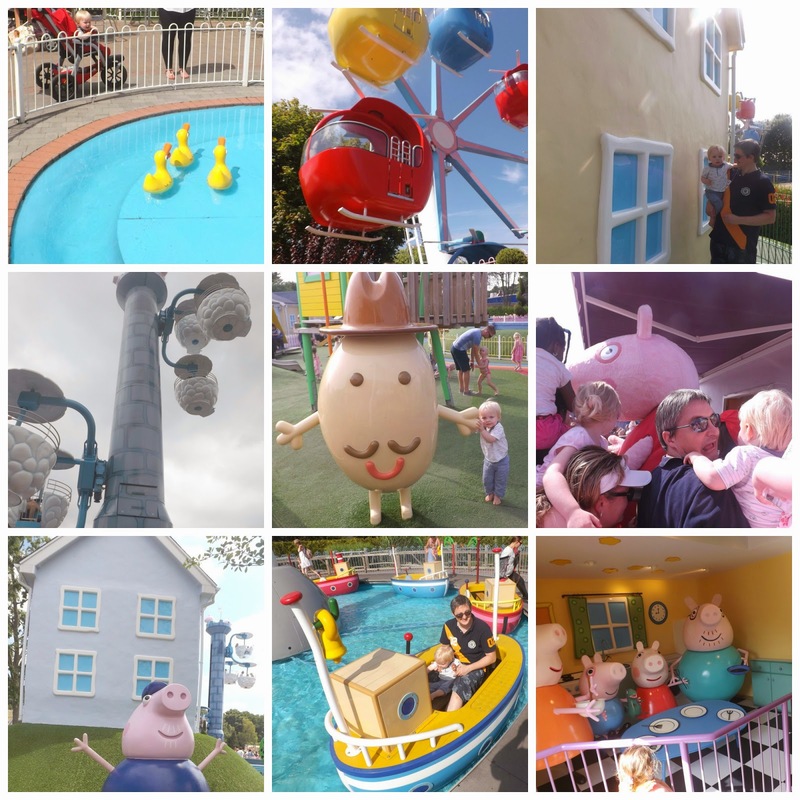 As soon as we approached Peppa Pig World, Tyne spotted a giant Peppa standing on top of the Hot Air Balloon ride and started pointed and squealing excitedly! We were all blown away by how lovely it was....everything was so bright and colourful, it was really like stepping into the TV and into Peppa's world. There were figures everywhere of the various characters (Tyne seemed to like Grandpa Pig best! ), and the houses were dotted around too. 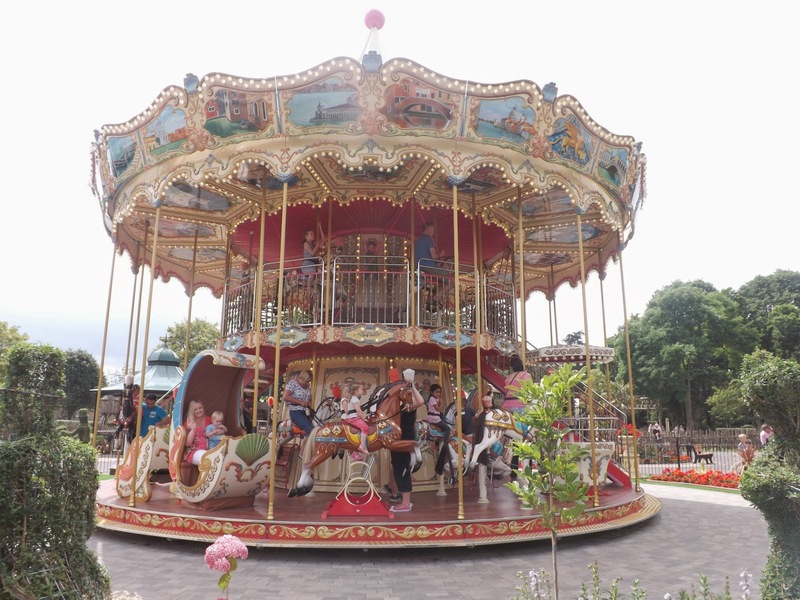 There were traditional fairground games with chances to win Giant stuffed Peppa Pig toys, a large indoor play area, a lovely outdoor park, a "Muddy Puddles" water play park, and Daddy Pig's Big Tummy Cafe as well as various ice cream & snack kiosks. Then of course there were the rides! 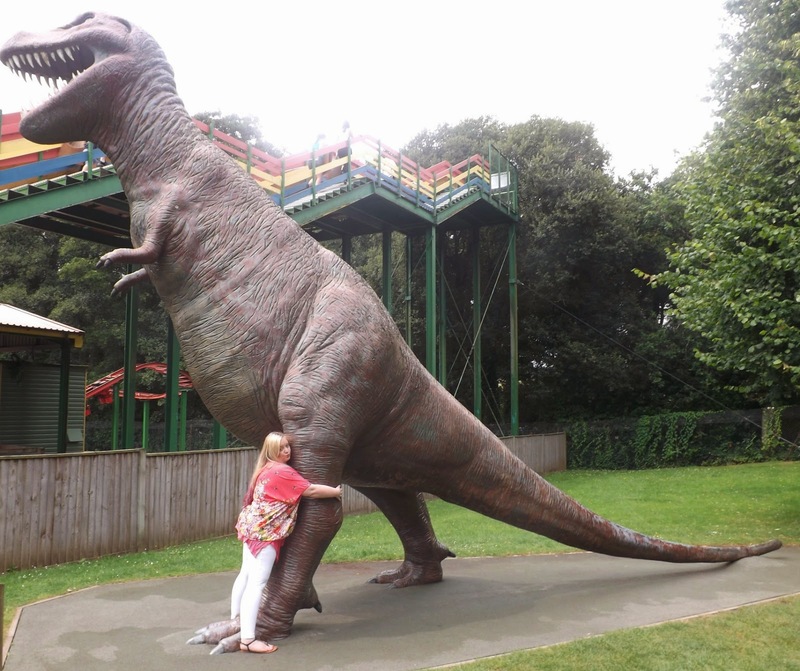 The only one that Tyne was too little for was George's Dinosaur Adventure Ride....but every other ride he was able to enjoy. And we went on all of them! Numerous times! 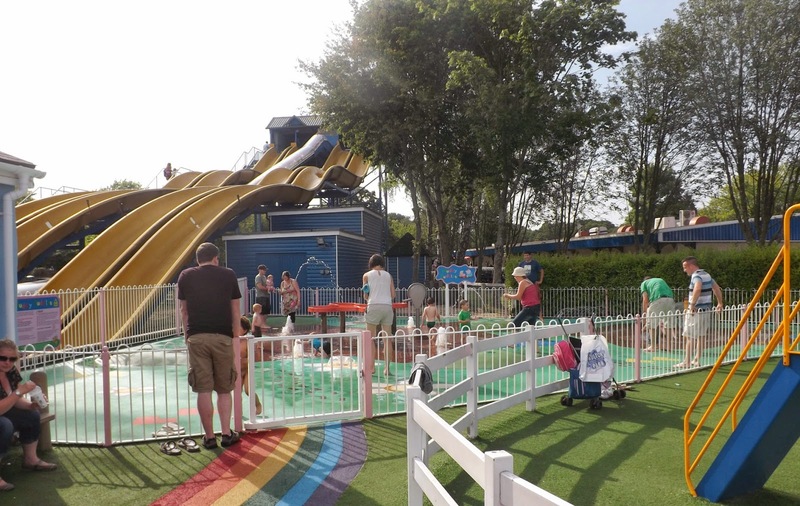 We were so lucky that on both days we enjoyed perfect hot weather, but hardly any queues! On our second day we had been forecast rain and storms, but these didn't materialise....but the forecast did keep the Saturday crowds away and it was even quieter than the Friday had been! Ideal! Because of the lack of queues, we went on all of the rides at least twice....some we went on 3 or 4 times. 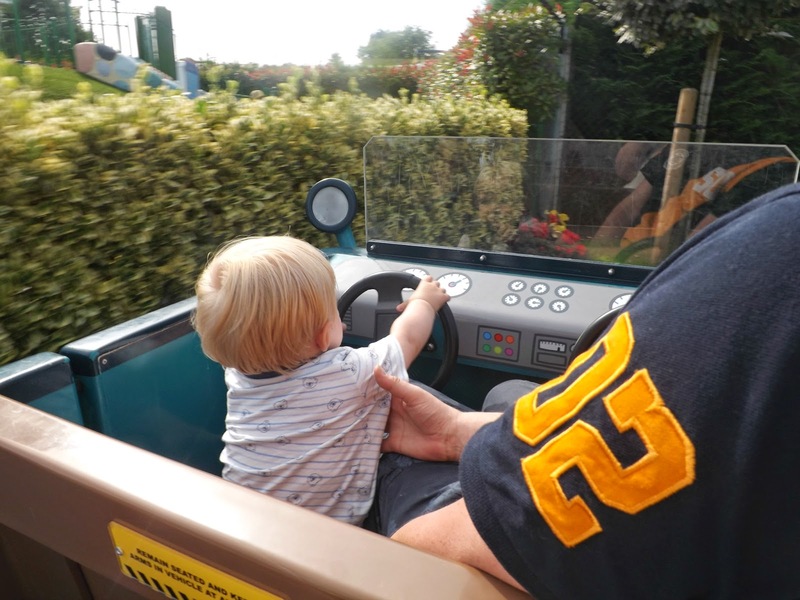 Tyne's favourites were the Car Ride and the Train....he loved steering the cars, and was delighted that Grandpa Pig was driving the train! I loved the Hot Air balloon ride and the Boat trip personally, and Jon being the thrill seeker was all about The Windy Castle....I wasn't convinced about going on that as it looked rather high and the carriages seemed to be swaying a lot....but I braved it, and hated every second!!! I'm such a whimp! The food outlets in the park were really good....on the second day we had lunch at Daddy Pig's Big Tummy cafe which had great options of pizza and hot dogs etc for adults, and sold items such as small cheese sandwhiches and sausage rolls for children....perfect sizes for toddlers. I found the prices to be very reasonable for most things, but I did think the ice cream was a bit of a rip off at almost £3 per ice cream! However, the rest of the prices left me pleasantly surprised as I go to these sorts of places fully expecting to be ripped off. 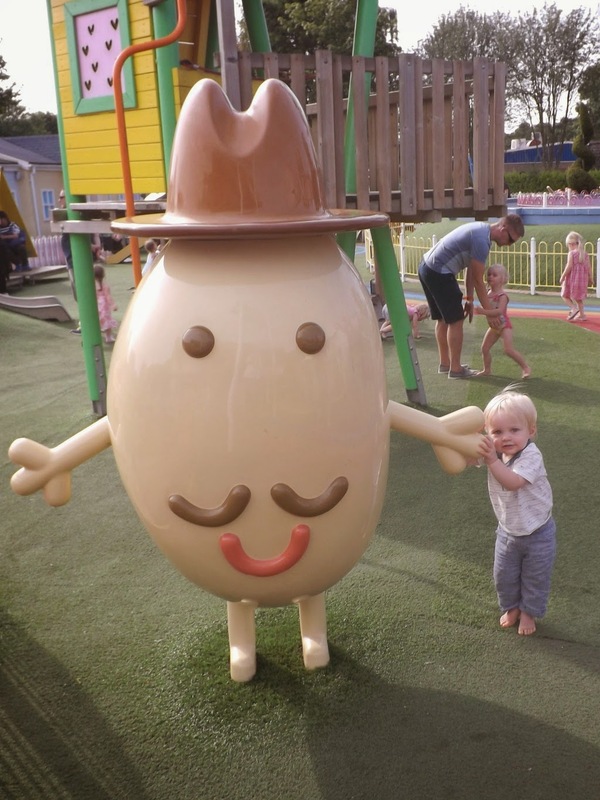 There were lots of photo opportunities around the park, with some rides taking your photo and also a Magic Photo Studio which allowed you to be projected in to the world of Peppa Pig! The photos were available as framed prints, keyrings or magnets with each item costing £8...but you could purchase a set of any 4 for £20. We chose this option and were given 4 vouchers for 4 photo items, which could be redeemed on any visit....very handy and a good saving! 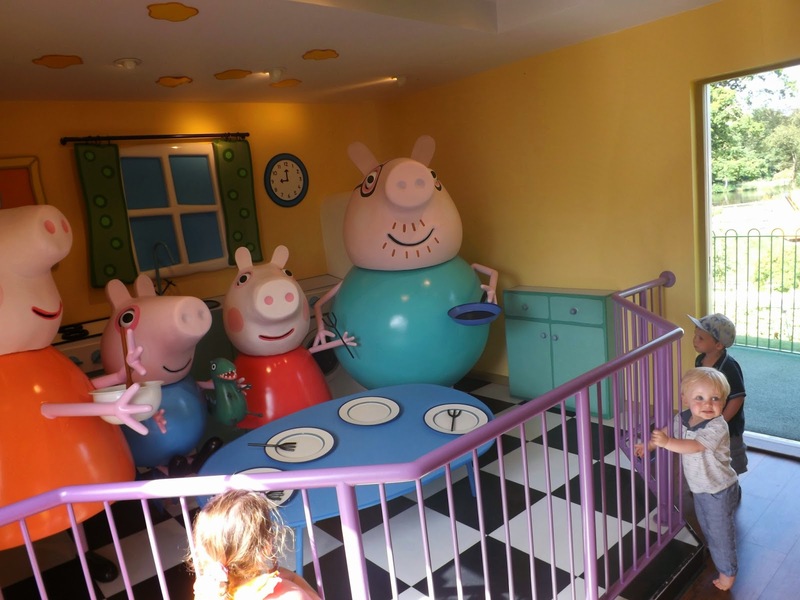 As well as the rides, there was also Peppa's house which you could go inside - Tyne loved this!!! 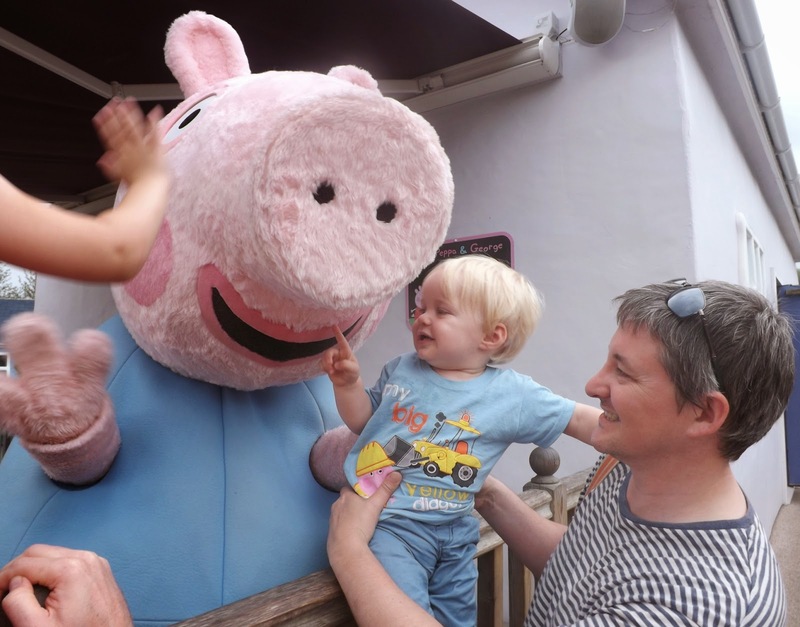 And of course there was the chance 4 times a day to meet Peppa & George themselves! But it was very fun and I actually felt quite emotional at seeing so many children so genuinely happy and excited! 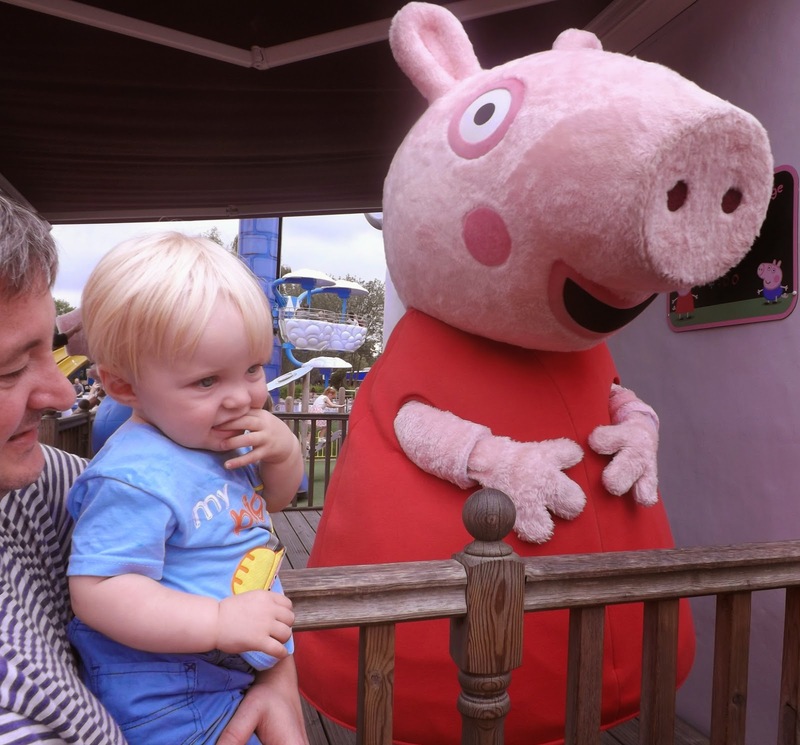 Peppa & George certainly didn't rush their visits and made sure they stayed out until every child had got a cuddle or a high 5. 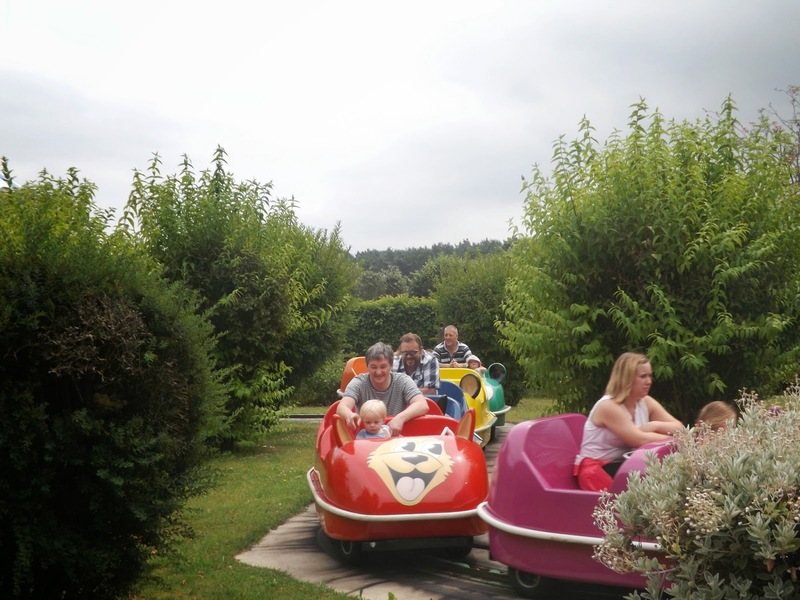 On the second day, we also explored Paulton's Park itself which is really beautiful with such great choice of rides. 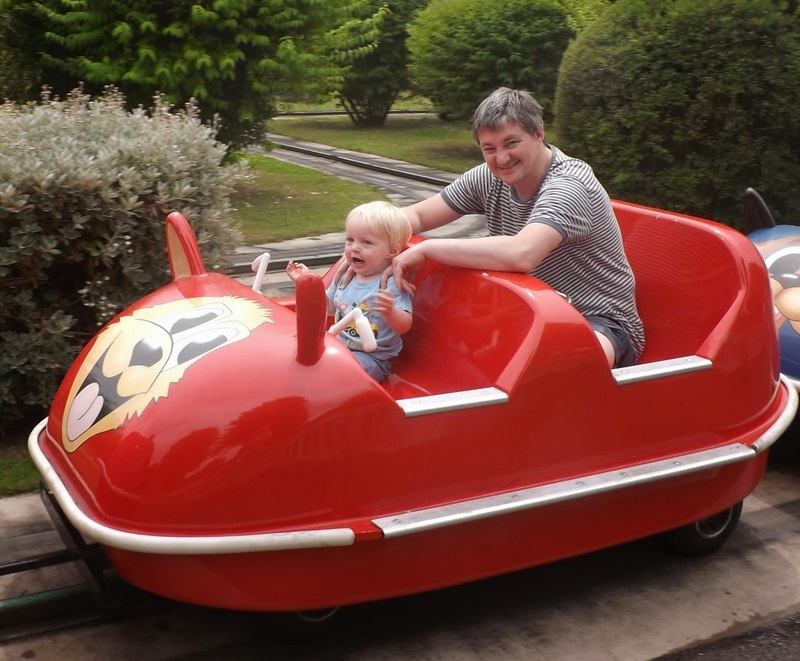 There is plenty for thrill seeking older children and adults, but lots of lovely gentle rides for younger ones too. I absolutely loved the Victorian Carousel...so beautiful! 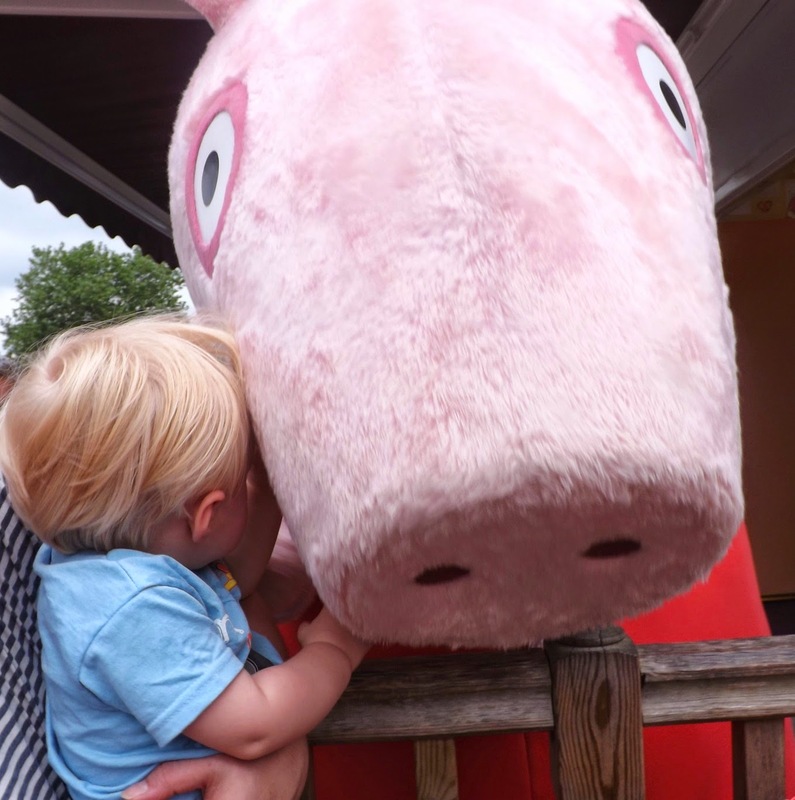 All in all, we absolutely adored our 2 days at Peppa Pig World and we are already excited about when to go back. 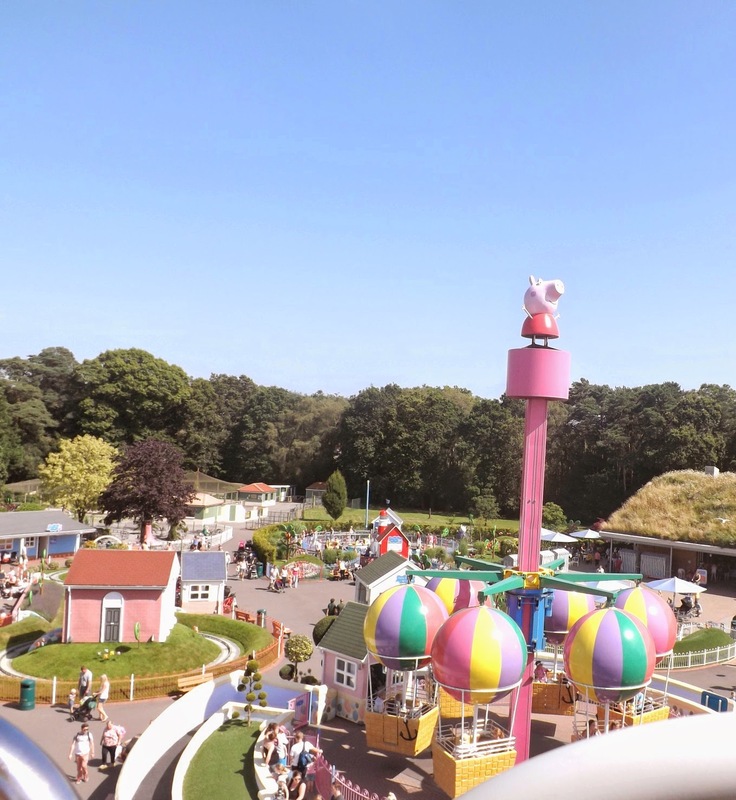 We're sailing out of Southampton for our cruise holiday in September and we think it would be great to get there early and have the day at Peppa Pig World first! And in closing.....in case you're wondering....this is how a childs face looks after a day at Peppa Pig World! 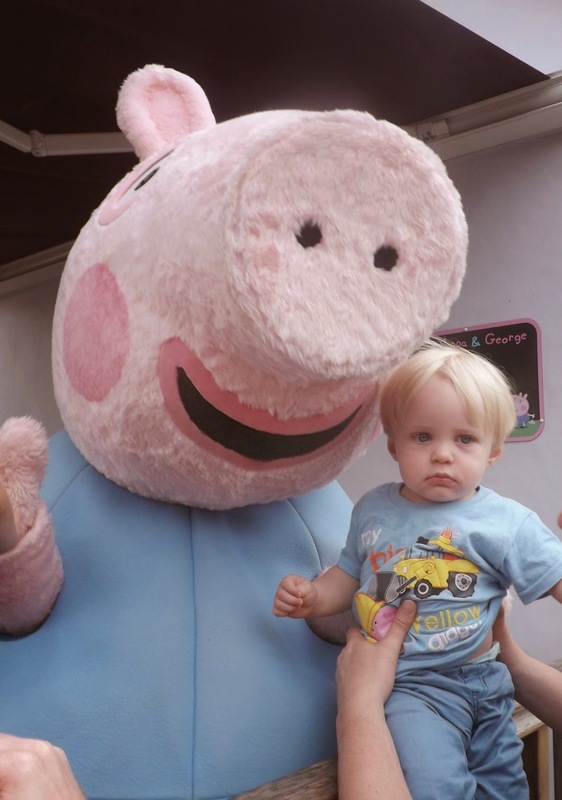 Lovely pictures, Tynes little face is adorable when hes meeting Peppa. It looks like a fab place to visit I think my youngest would love it to. 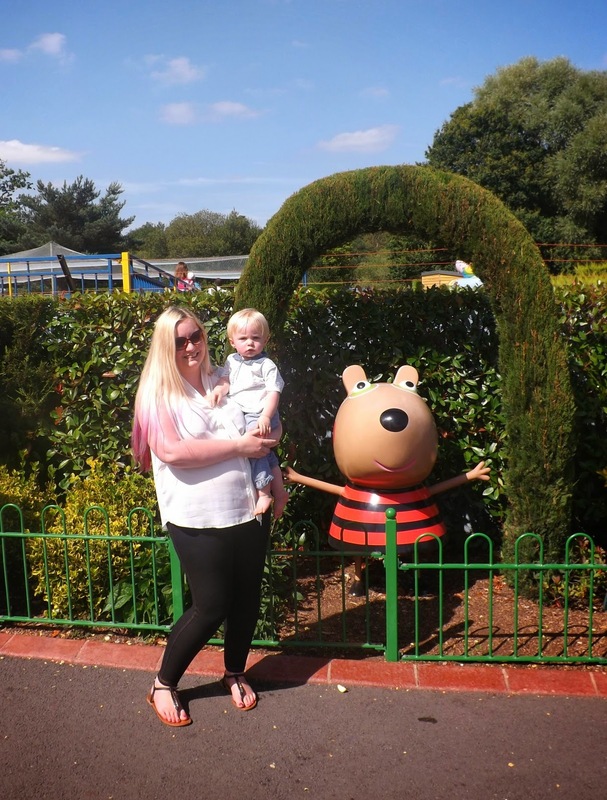 Lovely post, I really want to take my god son to Paulton's park but he is a bit too young yet as it is not far from where I live.